Bosch’s enhanced night vision system “Night Vision plus” makes driving in the dark even safer for drivers and other road users. Like its predecessor, this active safety system provides a high-contrast image of the area immediately ahead of the vehicle. Now, however, this image is also analysed. Pedestrians are identified and highlighted on the screen. This allows the driver to take appropriate action at an early stage, considerably reducing the risk of accidents involving pedestrians. Analysis of accident data in Germany compiled in 2005 show, for example, that the danger of a fatal accident is twice as high at night as during the day. “Night Vision plus” helps prevent night-time accidents involving pedestrians. The first production car to feature this system was the new Mercedes-Benz E-Class in 2009. The technology, known within Mercedes-Benz as “Night View Assist Plus” is also available on the new generation S-Class. 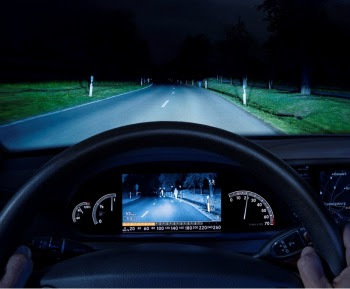 The Bosch active night vision system uses four main components to provide an accurate reproduction of the area immediately ahead of the vehicle. Infrared headlights, whose beams are invisible to the human eye, illuminate the road. The illuminated area is recorded by a camera which is installed behind the windscreen. The images created then are processed by a control unit and shown on a high-resolution display in the cockpit. The infrared headlights have a range of 150 meters, three times more than common low-beam headlights. At the same time, however, they do not dazzle oncoming road users.